http://media.blubrry.com/w2l7/p/media.blubrry.com/noodlemx/p/welcometolevelseven.com/wp-content/podcast/WTL7_180AoS.mp3Podcast: Play in new window | Download It’s the return of the Koenig’s! Billy and Sam are joined by the rest of the family, while Radcliffe and Russians are after the Darkhold! More secrets are revealed, including the mysterious LT Koenig! And so The Patriot’s secrets are finally revealed in Marvel’s Agents of SHIELD! And the status quo gets shaken up in a few different areas! Some of them for the better! Join Ben, Stewart, and Samantha as they talk about what it all means! 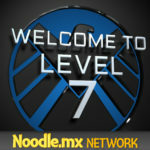 http://media.blubrry.com/w2l7/p/media.blubrry.com/noodlemx/p/welcometolevelseven.com/wp-content/podcast/WTL7_165AoS.mp3Podcast: Play in new window | DownloadBlackouts hit the world’s major cities and SHIELD is in the middle of it…leading to ANOTHER new normal for the team and there organization! Also, from the news: Sony planning Spider-Man spinoffs? Blade NOT joining the NMC! Sigourney Weaver is the Defenders’ Big Bad!